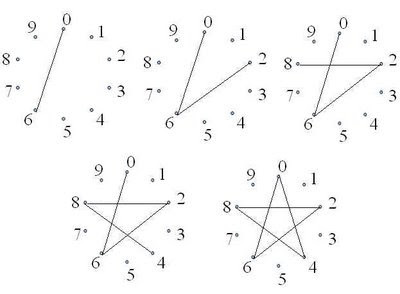 I was inspired to look at star polygons like the one above this after seeing this post by David Vancouvering, which was picked up by math teachers at play. 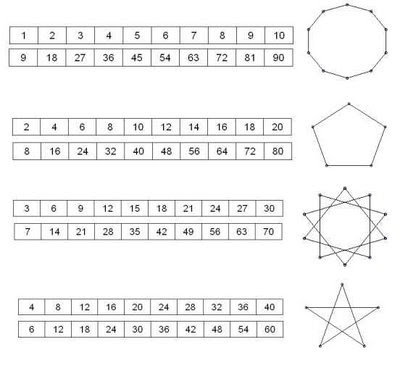 It seems that there are a number of ways to use these polygon diagrams to explore multiplication and division facts. 4. continue until you have drawn a line back to zero (draw lines 6 to 2, 2 to 8, 8 to 4, 4 to 0). 4. draw connecting lines between the dots you land on (in order) until you reach zero (draw lines 0 to 6, 6 to 2, 2 to 8, 8 to 4, 4 to 0). The numbers you land on will match the last digits of the n times table (in order). These diagrams were likely much more common in the 'new math' curriculum of the 60s and 70s when modular arithmetic became a standard part of grade-school mathematics. 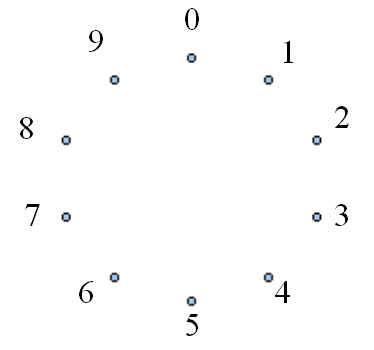 Here, in looking at the last digit of a number, we are evaluating the multiples "mod 10" or, in the language that was used in the (old) new math, we are doing "clock arithmetic on a 10-hour clock." What are some things that we can observe about this? This highlights a nice symmetry among the last digit of the n and 10-n multiplication tables. For a given n, how many points does its 'last digit polygon' have? This may be a nice way to motivate the idea of 'least common multiple,' since the number of verticies for the polygon you get from n is given by v = lcm(n, 10)/n. In general, if you look at drawing polygons by skip-counting by n around a d-point circle, the number of vertices you get is v = lcm(n, d)/n.